Keeping in mind ever-evolving requirements of our respected clients, we are manufacturing a premium quality range of Fuel Storage Tanks. With rich industry experience and knowledge, we are committed towards offering an excellent quality range of Oil Fabricated Tank. Omega Construction Equipment Pvt. Ltd.
We manufacture Oil and Chemical Storage Tanks by using mild steel and stainless steel and other raw materials as well. These tanks are very sturdy and can be availed in several sizes and shapes. These Oil and Chemical Storage Tanks are used for storing fuel, water, oil, liquids and chemicals too. Our commitment to fulfill different needs of food processing industries motivates us to manufacture superior quality Oil Tank. Our range of oil tank is generally used in snacks and confectionery lines for storing oil. 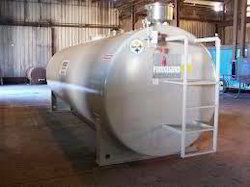 We provide this range of tank in several sizes and capacities as per the client’s stipulations. Being a leader in the industry, we are engaged in providing our clients qualitative Heavy Furnace Oil (HFO) Storage And Distribution Systems. Tanks can be fabricated on site if required (depending on capacity of the tank). This service is rendered by our adept professionals using high grade tools and the latest techniques. 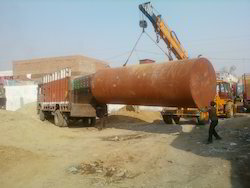 We bring forth an extensive range of Horizontal above Ground Oil Storage Tank to our valuable clients. Our product range is widely used for various industrial projects as per the requirements of our clients. These products are fabricated from high grade raw material that is sourced from some of the reputed vendors of the industry.